Google has been known to shut down old services now and again in its so-called spring cleanings. But nobody seriously expected it to shut down Reader, its trusty and popular cloud-based RSS reader, despite it being in maintenance mode for years. When the shutdown announcement came, it hit the RSS community like an earthquake, with news junkies scrambling for replacements. I was one of those users, and if I learned one thing from this, it's not to rely on a free service from a behemoth corporation for mission-critical work (tech writers really do need RSS). I found a service developed and run for profit, by just a single, committed individual: NewsBlur, by developer Samuel Clay. This online news reader offers a sophisticated interface, machine-learning, story sharing, and is everything Google Reader should have been, had Google taken a more lasting interest in it. A paid account will run you $24/year, but a feature-limited free version is available, too. NewsBlur's three-pane interface takes advantage of modern-day wide screens. NewsBlur wasn't developed as a reaction to Google Reader shutting down: The service has been around since 2009, so by the time the shutdown announcement came, it was a mature product. It doesn't feel like a single-person project, either. The interface is polished to a fully commercial level, and is both responsive and sophisticated. One of the perennial problems of RSS is that there's just so much of it. Subscribe to a dozen feeds, and you may have to contend with hundreds of new stories every day. This can quickly become overwhelming, but NewsBlur tries to help by letting you train it with the stories you like best and those you'd rather avoid. 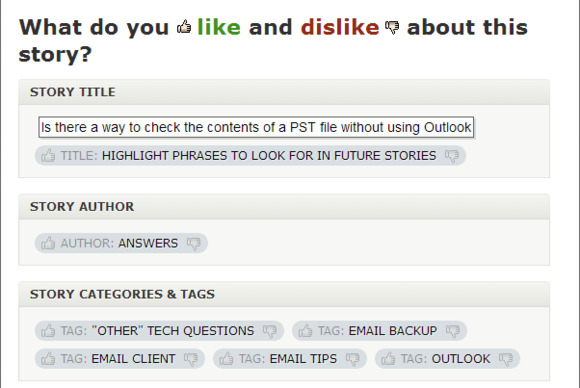 Training is an active process: When you read a story you particularly like or dislike, click the Train button. NewsBlur will then pop up a dialog showing the story's title, author, tags, and publisher, so you can upvote or downvote any of these attributes. In other words, it is easy to tell NewsBlur something like "I like stories by this author, but not about iOS". You can then filter your list of stories accordingly, whittling it down to just a handful of stories NewsBlur thinks you should read. Training lets you upvote or downvote specific tags, authors, and title keywords. 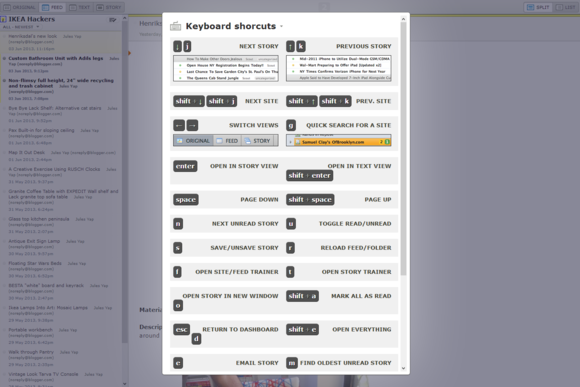 NewsBlur supports many keyboard shortcuts, so you don't have to keep reaching for the mouse. 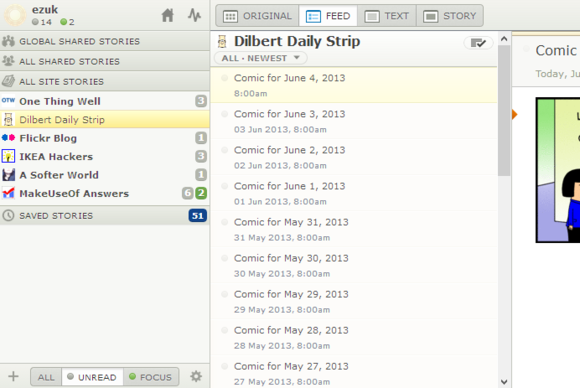 It also offers four different ways to view each story, and two screen layouts. You can also tell it exactly what services you want to use to share content with friends, so the interface isn't cluttered with services you never use. You can pick the default text size and font type of the feed view, and whether or not it should show comments from other NewsBlur users who have shared the story on NewsBlur. If you're a heavy keyboard user, NewsBlur has you covered. I could go on listing features, but that would be missing the point: NewsBlur works. It holds up well in daily use. It's responsive, and it makes it easy to manage large collections of subscriptions. Being a paid service, it's completely free of ads, and is a joy to use. If you value RSS, you can't really go wrong with NewsBlur. NewsBlur is more than capable of replacing Google Reader. If you use RSS, you should try it out.